Got sniffles? Runny eyes? Post-nasal drip? Yes, it's that time again, when the cedar pollen blooms and billows in the spring air, and allergy sufferers suffer. "Blame it on the boys," said Ocracoke Health Center's Dr. Erin Baker as she wrote a prescription for my eye drops. "They are spreading their seed." Ocracoke's cedar is the native Eastern Red Cedar, which is technically a juniper, with the Latin name Juniperous virginiana. (Fun fact: true cedars, within the scientific genus Cedrus, are native to Europe and Asia.) Our cedars are "dioecious" – the individual trees are either male or female. It's easy to tell them apart: the female bears the fruit – the lovely grayish-blue berries that adorn fresh cedar wreaths at Christmas – and the males sexually assault human passersby with their early-spring effusions. Cedar pollen is considered a severe allergen, causing itchy, watery eyes (check! ), sore throat (check! ), runny nose (check! ), headache (check! ), sinus pain (check!) and sleep interruption (is that why I'm writing this at 4am?) 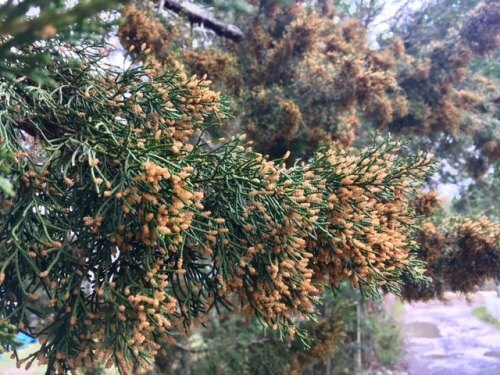 Out west, where the mountain cedars produce even more pollen than ours do (everything is bigger in Texas) the symptoms are called "cedar fever" and a quick google shows that the recommendations for treatment are the same here and there: antihistamines. Also: staying indoors. That's the tricky part. Every year I look forward to spring and the simple pleasure of puttering in the yard. Every year I forget the misery of allergies until they are upon me. I want to be outside, but my trees are trying to kill me. I have three cedars in my yard, two boys and one girl. Most of the male effluvium ends up in my eyes and throat, but at least a little bit of it must reach the receptive female because she never fails to produce an abundance of berries. The berries feed birds and small mammals, who then, ahem, "disperse" them around the yard, leading to the tiny cedar seedlings that I weed from my flower beds each year. They are cute, but prickly. Cedars are tough. They can grow almost anywhere, in any kind of soil. They can withstand heat, cold, and drought. They are wind-resistant when they are small and scrubby, and salt-tolerant, which is why they do so well on Ocracoke. They feed small critters and their wood is useful and fragrant. Bees can use their pollen to make honey. I love cedars, I just wish they loved each other a little less passionately. The cedars' mating season will be over by mid-April, just in time for the live oaks to take over. The yellow live oak pollen arrives at exactly the time when the weather entices me to open windows and doors. It's diabolical. Oh well, happy spring!